Today’s video game fashion feature is Catherine, a 2011 adventure and puzzle platformer game for the Playstation 3 and the Xbox 360. It follows a man named Vincent, a commitment-phobic bachelor who is dating a woman named Katherine. Katherine wants to get married and is perturbed by Vincent’s indecisiveness. One day Vincent goes to the local bar, gets drunk, and wakes up to find another woman in his bed… another woman who just happens to be named Catherine. Going back and forth from the local bar to the inside of Vincent’s head, you interact with Catherine, Katherine and some of Vincent’s friends as he tries to hide the two women from each other and eventually decides between them. 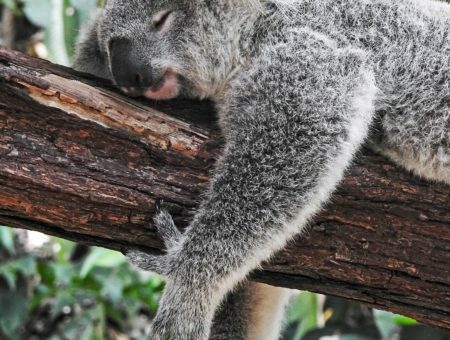 At the same time, men have been dying in their sleep. When the same dreams these men experienced begin to plague Vincent, not only does he have to choose a woman to be with, he has to stay alive long enough to do so. Vincent Brooks is our 32-year-old protagonist. The man has a bit of a dilemma on his hands. He’s been dating a woman named Katherine for five years, but she wants something more. However, he can’t give her that — or at least, he doesn’t know if he can — so he keeps brushing her off. One day, he meets another young woman named Catherine and it complicates everything. Now Vincent doesn’t know who or what he wants. Vincent is the stereotypical man who never grew up. I decided to channel his, let’s say “relaxed” vibe, in this look with some maroon jeans and a matching pair of red Converse. A pink crop top and a striped bomber jacket continue the outfit’s youthful feel. Any girl pretending to be grown-up needs an adult bag, so I threw in a light-colored Betsey Johnson bag. I finished with a pair of tortoiseshell shades, perfect for anytime you want to sneak around like Vincent — or just shield your eyes from the springtime sun. Catherine is the seductive young woman that Vincent meets at the local bar one night. She’s bright, bubbly and – most importantly – the complete antithesis of his current girlfriend Katherine. Catherine’s outfit consists of a lacy white slip with a bright red bow tied around it, along with white thigh-high socks. Obviously, this combo is a little over-the-top for everyday wear (even to a party), so I swapped it for some white jeans, a matching white crop top, and a white leather choker. While Catherine wears a lot of white, she’s far from innocent, so I added pops of red with strappy heels and lipstick. I also added a romantic vibe with some heart-shaped hoops. 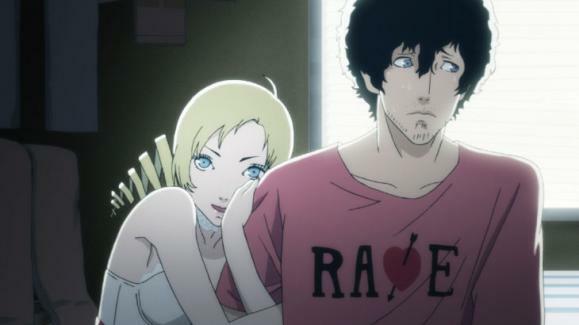 These touches aren’t just here for the sake of adding interest; they’re directly representative of Catherine’s sultry, seductive side. Katherine McBride is Vincent’s 32-year-old girlfriend who is tired of his commitment-phobic attitude. After five years of dating, she’s ready to take the next step in their relationship, and she constantly tells Vincent so. However, he isn’t budging, always brushing her off when she talks about marriage. While Katherine is a little up-tight and demanding, she’s also quite fashionable — she works for a clothing company after all. 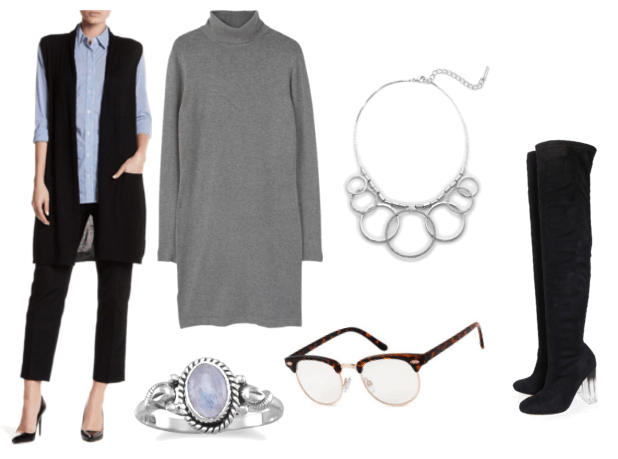 Ditching her turtleneck, pants, and heels combo, I went for something a bit more chic with a grey turtleneck dress and a long, black vest. Some glasses add to Katherine’s serious, no-nonsense look. Keeping up with the neutral color scheme, I threw in some high black boots. To accessorize this look a bit more, I added a looped necklace reminiscent of Katherine’s belt and a single stone ring (to reference what Katherine wants from Vincent). 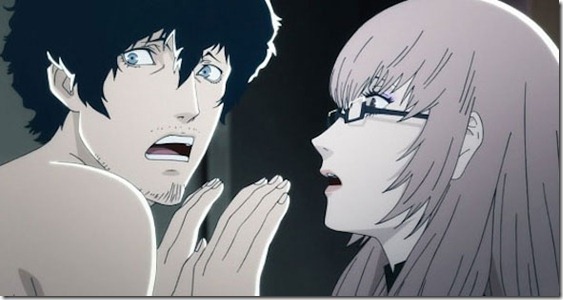 How did you guys like Catherine? Was it a piece of cake to play or was it too much to handle? 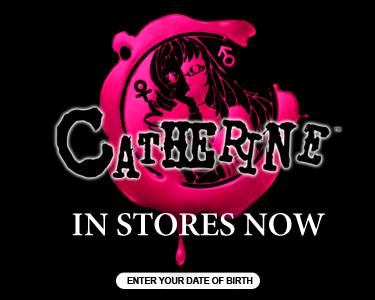 Who did you end up with, Catherine or Katherine? But more importantly, who did you want to end up with? Let me know in the comments!